SOD's ChiNa Matsuoka hit by car on 1 June, risk retirement by Sep. - ScanLover 2.0 - Discuss JAV & Asian Beauties! 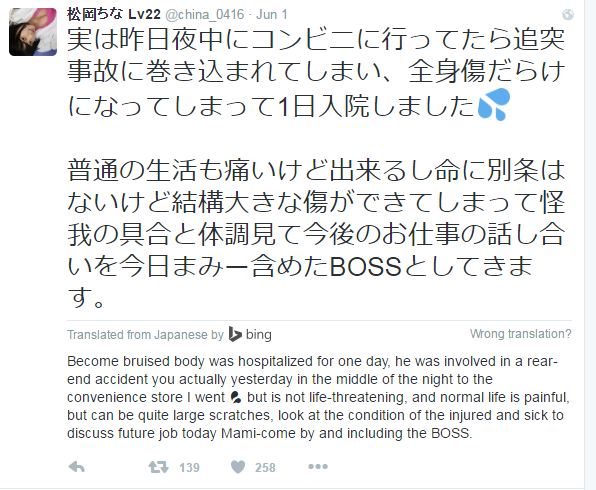 SOD's ChiNa Matsuoka hit by car on 1 June, risk retirement by Sep.
That is a real shame. She is a good performer...enthusiastic and with a beautiful body. I feel sorry for her. Let's hope she makes a swift recovery! Oh poor thing!!! Shucks!!! Hope she's ok and gets well real soon!!!! Unfortunately, the merge feature is not yet available in this forum. Where does she mention anything about retiring in September in that Tweet? midnightpapa Who is your source? Don't know who she is but I hope she is alright and get well soon. Damn, that's a shame. Hopefully she can take her time to heal and return 100% fit.